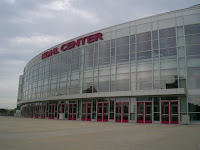 This Sunday, the Wisconsin Badgers host the undefeated OSU basketball team at the Kohl Center. Ticket King Milwaukee still has a few Badgers basketball tickets available for Sunday's game. Sunday's game will be huge, especially if the Badgers can upset the number 1 ranked Buckeyes. Not to mention, the Badgers and the Buckeyes are huge Big Ten rivals. If you can remember back to this year's Badgers football season, the Badgers football team upset OSU at Camp Randall, handing them their only loss of the season. Go Badgers!